I’m sure I’ll blog again after the conference. I’m slightly neurotic about being away from work for an entire 6 days. We’ve each made a thousand lists of “things to bring” and I’m hoping my current “up at 4am” sleep schedule doesn’t get too interrupted. 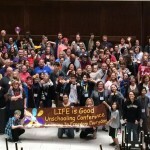 This entry was posted in Learning, Life, Parenting, Road Trips with Kids, Unschooling Events, Washington.